The supernatural comedy will open Thursday, April 7, at the Huntley Middle School auditorium, 1515 S. Fourth St. in DeKalb. “Noel Coward wrote this play in 1941, at the worst of the bombing by the Germans over London. He wrote it in five days to cheer up everybody, and I’m sure he did,” Ridge says. Set in England in 1935, “Blithe Spirit” takes place in the home of Charles and Ruth Condomine. 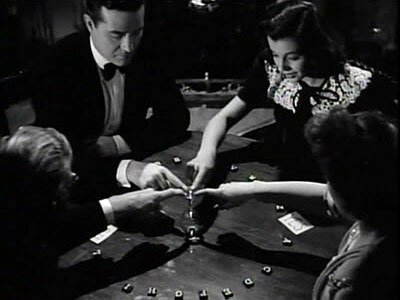 To help Charles to get information for his next book, a medium named Madame Arcati is invited to conduct a séance. However, things don’t seem to go as planned as Madame Arcati brings back Charles’ first wife, Elvira, from the dead. To put it simply, Ridge says, the play is about a “man with two wives.” Of course, she adds, Charles is in for some trouble. Throughout the play, Charles is the only one who can see his dead wife. Although Elvira knocks over vases, throws things and generally attempts to make Charles’ life miserable, his living wife, Ruth, believes he’s crazy and is only claiming to see the ghost causing havoc. The ghostly special effects were designed by theater design and technology major Charles Hoeg. “If you need something to shatter, or a hand prop to light up, or stuff to fly off shelves, doors to open on their own, that’s what I’m doing,” Hoeg says. “Blithe Spirit” will be a special production for Ridge, as it is the last play she will direct for the school after teaching at NIU for 25 years. Shows are scheduled from Thursday, April 7, through Sunday, April 10, and from Thursday, April 14, through Saturday, April 16. Show times are at 7:30 p.m. Thursday through Saturday and 2 p.m. Sunday and the second Saturday. This production is not affiliated with DeKalb Community Unit School District 428. Tickets are $17 for adults, $14 for seniors, $9 for students and $6 for children. Tickets are available online or by contacting the box office at (815) 753-1600 or email sotdboxoffice@niu.edu.